Hublot has once again proven itself to be first, unique and different, as the first luxury brand to invest in the international professional poker circuit as Official Timekeeper and Official Watch. 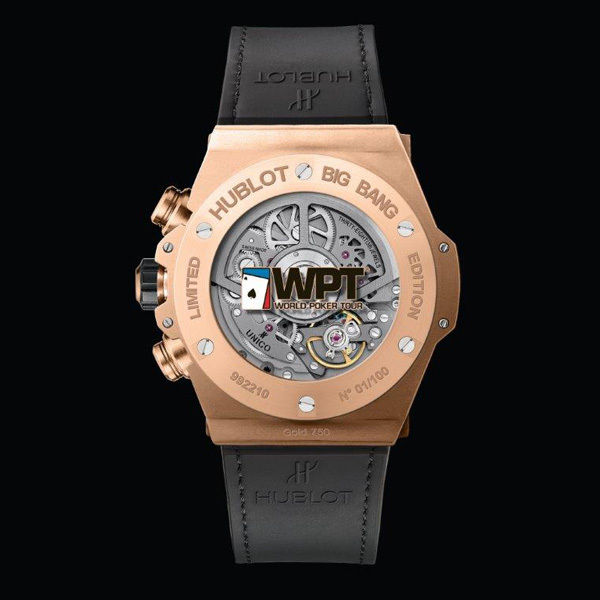 To seal the presence of the Swiss watchmaking brand in this new field, a Big Bang World Poker Tour®, with a design heavily inspired by the game, was presented at an event organised in Las Vegas and attended by CEO of Hublot Ricardo Guadalupe, as well as the greatest players on the circuit. 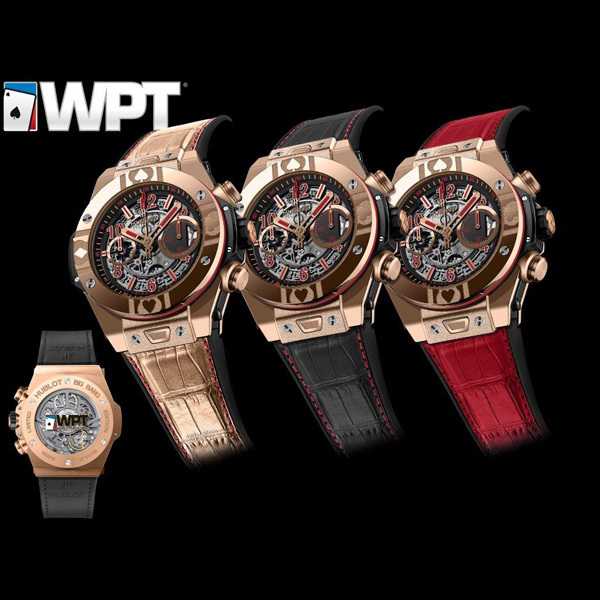 17 December 2014 – Las Vegas (USA) – After football, American basketball, and recently cricket in India and Australia, Hublot has achieved yet another master stroke by signing with the World Poker Tour in Las Vegas to become Official Timekeeper and Official Watch of the international poker circuit. Ricardo Guadalupe, CEO of Hublot, chose to announce the partnership at the WPT® Five Diamond World Poker Classic, WPT Alpha8™ Las Vegas, organised and televised (FOX Sports) from 15th to 20th December at the Bellagio, the legendary Las Vegas hotel and capital of international poker. The event was attended by the greatest professional and amateur players on the poker circuit. 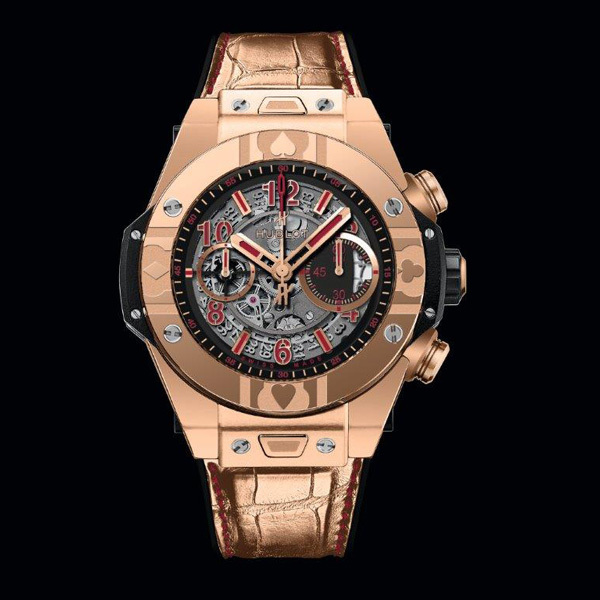 Ricardo Guadalupe, CEO of Hublot, remarked "Hublot has once again proven itself to be first, unique and different, as the first luxury brand to become Official Timekeeper and Official Watch of the international professional poker circuit. We chose the World Poker Tour because its global presence, televised tournaments and quality of its players make it a benchmark in the game. I strongly believe that this field has great commercial and marketing potential. The tremendous success of our boutiques in Las Vegas and Macau are evidence of the possibilities. I am delighted with this great collaboration that awaits us." Hublot was the first luxury brand to enter professional football in 2006, with the immense marketing and commercial success that we expect of the brand. It was also the first luxury brand to enter American basketball in 2011. That same year, Ferrari chose Hublot to be its Official Timekeeper and Official Watch. In 2014, in addition to poker, Hublot was also the first luxury brand to enter cricket, one of the world's most popular sports, particularly widespread in India, Australia, the Middle East and in all Commonwealth countries, which offers Hublot great additional geographic coverage on four continents. 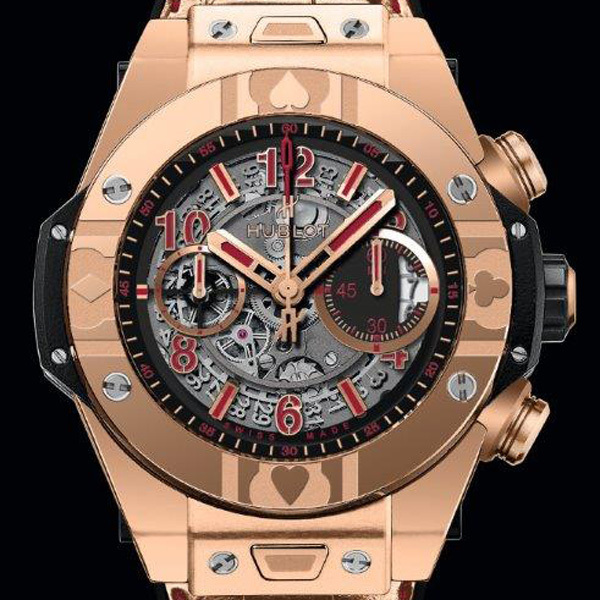 To mark the announcement of Hublot's entry into the world of poker, the brand has developed a limited-edition BIG BANG UNICO World Poker Tour with a design that suitably encapsulates the poker world. The watch chosen to entice the players was the iconic Big Bang, equipped with the in-house UNICO Manufacture Chronograph, unique in the industry for its column wheel and double clutch visible on the dial side. The new detail – which gives this watch its resolutely "poker" character – is a bezel made of 18K King Gold or steel that features an interplay of two different treatments, polishing and micro-blasting, which in particular showcase a heart, spade, club and diamond, the distinctive and universal symbols of card players. The UNICO Chrono movement is revealed thanks to a skeleton dial featuring the famous voluminous indexes and Arabic numerals, hollowed out and filled with red SuperLuminova ™. Two counters encircled by polished silver-plated rings, the first displaying the minutes at 3 o'clock and the second showing the small seconds at 9 o'clock, along with the date window located at 3 o'clock, complete the overall effect. 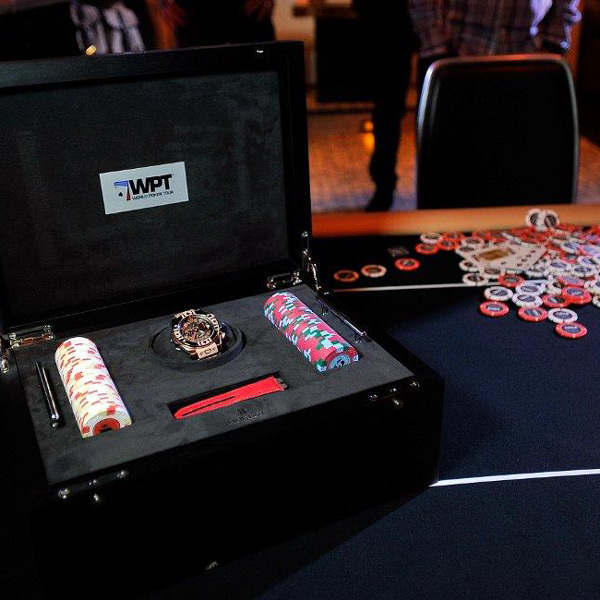 The sapphire crystal of the case-back also bears the exclusive symbol of the World Poker Tour® in transfer form. This 45.5 mm diameter Big Bang Unico World Poker Tour® is available in two versions: a limited edition of only 100 numbered pieces in 18K King Gold (Hublot 18K gold with an extra 5% platinum which gives it an even more intense red colour, thereby making it even more precious), and a more impact resistant steel edition, of 200 numbered pieces. Each watch is equipped with the famous, exclusive Easy One Click system which allows the wearer to switch easily between the three straps that come with the watch. All are made of alligator stitched onto rubber, and come in black, red and above all gold or silver treated, which confers upon the watch a very... "poker" look. Case Big Bang Unico - 45.5 mm diameter in polished and micro-blasted King Gold or steel Bezel Polished and micro-blasted 18K King Gold or steel, with the four card suit symbols 6 H-shaped titanium screws, polished & locked Crystal Sapphire with anti-reflective coating and Hublot logo Bezel Lugs Black composite resin and bezel ring in red composite resin Crown 18K King Gold or steel with black overmoulded rubber Hublot logo Push-pieces 18K King Gold or steel Case-back 18K King Gold or steel, sapphire crystal with interior anti-reflective coating World Poker Tour® exclusive symbol transfer Dial Matt black skeleton with two counters at 3 o'clock and 9 o'clock Polished counter rings, either rhodium-plated or plated in 5N gold. Polished indexes and numerals, either rhodium-plated or plated in 5N gold, red SuperLuminova™ Hands Rhodium-plated, satin-finished, red SuperLuminova™ Movement HUB 1242 Unico movement, developed and manufactured in-house by Hublot Automatic flyback chronograph – fully black PVD coated Frequency 4 Hz (28,800 Vib/h) Date White window at 3 o'clock Components 330 (38 jewels) Power reserve Approximately 72 hours Water resistance 10 ATM, i.e. approx 100 metres Straps Each watch comes with three interchangeable alligator straps, in red, black, and gold or silver treated depending on the version, with a King Gold or steel deployant buckle.